If you look at the middle left in the photo above, where the orange marigolds are, you’ll see where I stripped the sod off and then double dug the bed. I thought I had taken photos of the sod stripping, but this gives you an idea of the process. For my garden, I used a straight edge spade and outlined the garden beds first. Then I cut what I had outlined into 4-5 inch wide strips with the straight spade. Each strip was then cut every 5-6 inches. So far I haven’t removed any of the grass, I’ve just cut lines in the grass with the straight spade. I tend to cut smaller chunks than a lot of people because I have small hands when it comes to lifting the sod out. When all the cutting was done, I started at one corner and slipped the spade under a 4 X 6 inch piece of sod and popped it up and out. If I feel like a lot of the soil clings to the grass, I toss it dirt side up to the side and let it dry out for a day or two, then I crumble some of that dried top soil off the grass roots and back into the bed. What ever is left I put on my compost pile. Depending on the size of your new bed, this process may seem daunting at first, but just go slowly. I tend to just remove a couple of rows of sod a day and then spend the rest of my gardening time doing something more fun! When all of the sod/grass was finally removed, I did my double digging, which I also did not think to photograph. I guess I was too excited about starting the new garden and seeing all those wonderful earth worms wiggling around. Since the new garden was to be 20 X 20 feet, I decided I wouldn’t sod- strip and double dig the whole area, at least the first year. For the second method, I pulled out a pile of newspaper and went to Earl May and bought a large bale of straw for around $8. I covered the grass where I wanted another new bed with newspaper, 5-6 layers deeps. I soaked the newspaper with water (I sprayed mine down with the garden hose) and then covered the newspaper with a 4-6 inch layer of straw. I did part of the garden this way in the fall and expected the grass to be dead and rotting by spring so that I could just turn the rotted straw into the ground, but perhaps because we had a mild winter, this didn’t seem feasible in the spring. The newspaper covered with straw looked pretty much as it had in the fall, so I just left it the way it was. In part of this area I “planted potatoes”. I simply laid my seed potatoes on top of the straw, covered them with a scoop of compost and mounded a little more straw over the top. My potato harvest was not huge, but I was pleased with my return on such little effort. In my photo, you can also see where I planted pole beans by putting several scoops of compost on top of the straw and then planting the bean seeds in the compost. I paid extra attention to the parts of the garden I did not sod-strip and double dig, watering and fertilizing more, since I knew the roots wouldn’t reach as deeply as in the well dug beds. 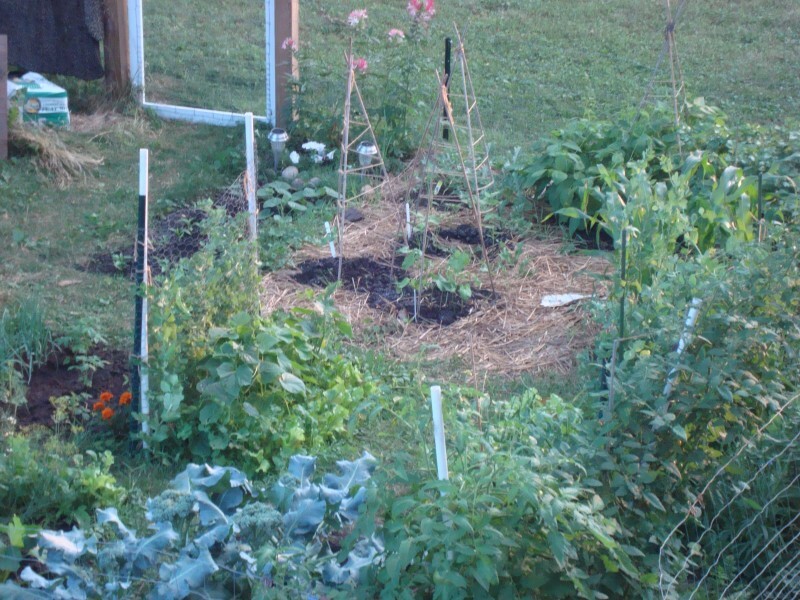 Now that fall has come, I have gone back over the newspaper/straw areas and turned all that into the ground and will probably double dig it in the spring. But at least I reduced my sod-stripping labor the first year by mulching part of the garden with newspaper and straw. Finally, I let some of the 20 X 20 foot garden area remain in grass. This was the area where I walked a lot, areas between beds, and also the little shady spot where I put my chair. I loved letting some of that grass grow, remembering what even Kentucky bluegrass can do when left undisturbed. It grew tall and waved gently in the summer breezes. They say the land in Iowa is the most altered land in the world. Most of Iowa was prairie, before man and his plow came to change the landscape. By leaving a little grass as a reminder of the prairie, and choosing to keep a machine out of my garden and try my hand with a more gentle soil preparation technique, I feel more connected not only to my garden and its soil, but to the history of the land I live on. Fun! My garden wasn’t very good this year. Planted beans in the mud just before we left for P.